Successful versions: Plug-in is simple to use and works great. 1. Create a layer. Name layer and then save it. Use the point data listed below, point data is from stair stringer lay out. Therefore, named the layer "Stair." 2. Use text editor to create text file. Name text file "Stair.odt" Save text file. Click on Plug-ins (Version 2.1.2). Click on Read ASCII points. ASCII dialogue opens. Click on files. Click on text file. Use "Comma separator" Format. Check mark "Connect points." Check mark "Draw 2D point" Type "Stair" for layer. 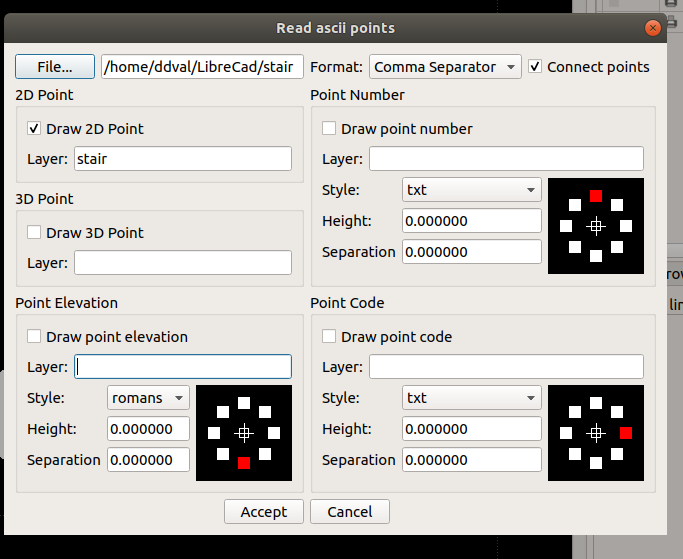 Attached is a screen shot of the "Read ASCll points" setup used. Version 2.2.0-rc1(Windows) works the same way. Plug-In ASCll Points settings for stair stringer. 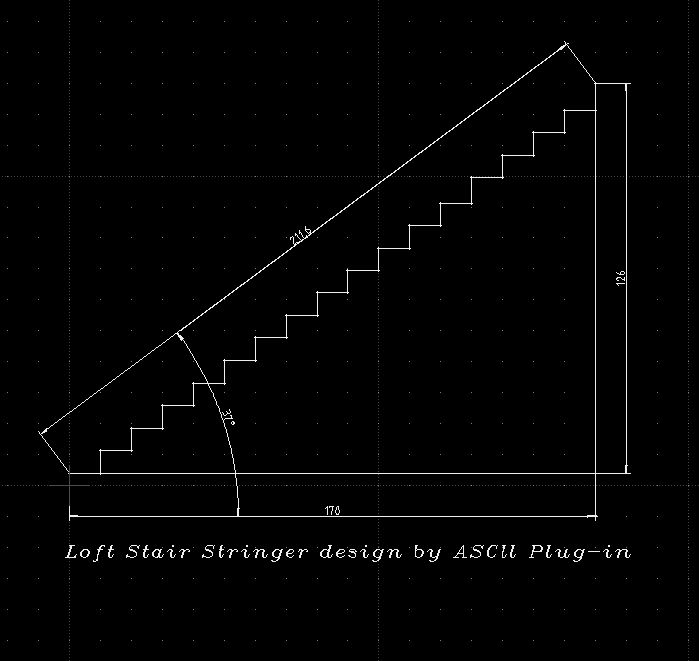 Example: ASCll Points Plug-in simplifies the layout of this stair stringer. Why an .odt text file? Does it not work with a simple .txt file? Yes, it must be a simple ASCII text file. Open Document Text format doesn't work, so the file extension .odt is misleading here. I assume the coordinates file was created with LibreOffice Writer and then saved as text format. In this case it is better to name the file whatever.txt. Alternatively use more basic text editors like Notepad or Gedit for this, as they use text format by default. You can use Excel or LibreOffice Calc and export as CSV file. This option is unbeatable when the coordinates are described by an equation. Then the spreadsheet can do the math and you have a base for parametrable drawings. Anyhow, many thanks for writing this down and share your experience. I think we should transfer this to our wiki and also take it into account for the documentation. I used LibreOffice Writer. However, now use Ubuntu gedit; truly a great text editor. Thanks for the heads up on LibreOffice Calc and CSV export. 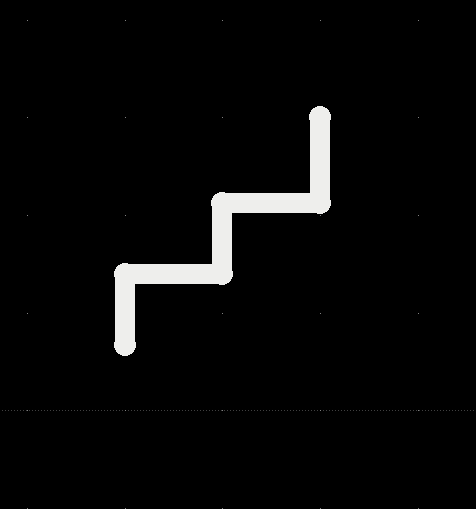 I'll use LibreOffice Calc on spiral stair case design. Thanks for your input and help. To unsubscribe from Tutorial Read ASCll Points Plug-In, click here. Please refer to LordOfBikes response to subject post for a complete answer to your question. Thanks for your reply.